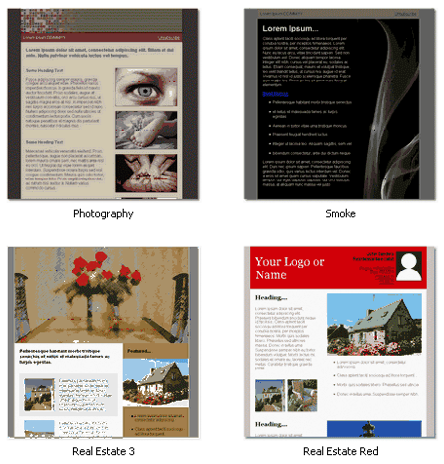 Our GroupMail Lite Edition comes with a collection of 30 free HTML email templates. The GroupMail Personal Edition has almost 100 Free HTML email templates and the Business Edition comes installed with over 130 free HTML templates! 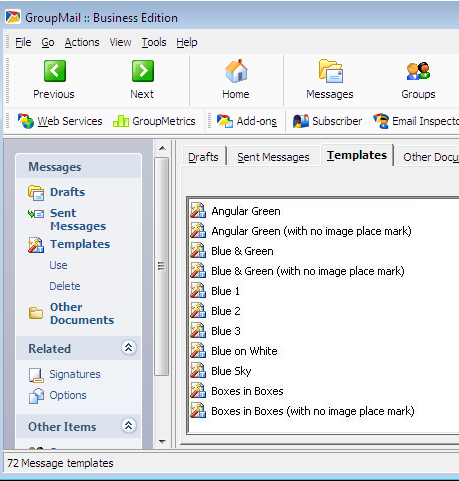 We are adding new HTML email templates to GroupMail regularly. How do I use the free HTML email templates in GroupMail? To use an email template, just click on the Templates tab in the Messages area and click on the HTML template you would like to use. You can use the wizard to customize the content of the email template and then click Continue to open it in the GroupMail Message Editor. Can I modify the free HTML email templates in GroupMail? You can modify the GroupMail HTML email templates as necessary, replacing the default HTML template images with your own (just right-click on the image and select “image properties”) and modifying the template content, formatting and colors as desired. Can I create my own HTML email templates and import them into GroupMail to use in my next email campaign? You can also import your own HTML email template designs into GroupMail (File/Import/HTML Document) and save them as user-generated email templates (File/Save As/A Template) in your GroupMail templates folder.